New Haven, Conn. – When you think of robotics, you likely think of something rigid, heavy, and built for a specific purpose. New "Robotic Skins" technology developed by Yale researchers flips that notion on its head, allowing users to animate the inanimate and turn everyday objects into robots. 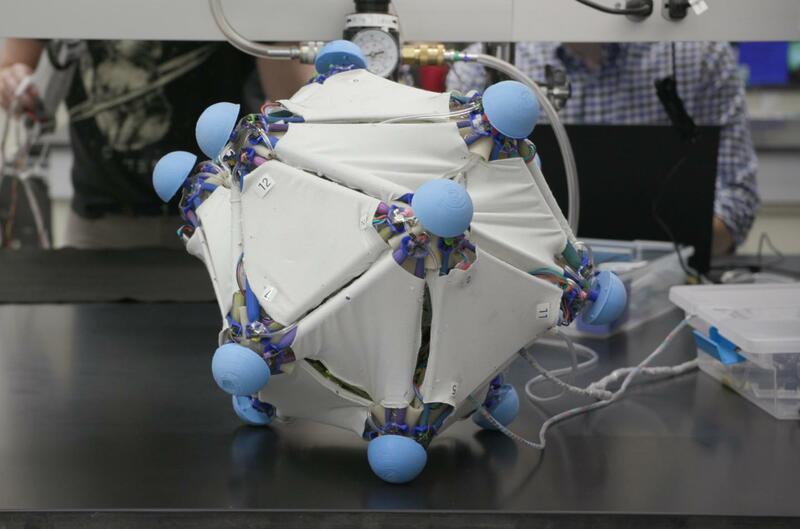 Developed in the lab of Rebecca Kramer-Bottiglio, assistant professor of mechanical engineering & materials science, robotic skins enable users to design their own robotic systems. Although the skins are designed with no specific task in mind, Kramer-Bottiglio said, they could be used for everything from search-and-rescue robots to wearable technologies. The results of the team's work are published today in Science Robotics. The skins are made from elastic sheets embedded with sensors and actuators developed in Kramer-Bottiglio's lab. Placed on a deformable object — a stuffed animal or a foam tube, for instance — the skins animate these objects from their surfaces. The makeshift robots can perform different tasks depending on the properties of the soft objects and how the skins are applied. "We can take the skins and wrap them around one object to perform a task — locomotion, for example — and then take them off and put them on a different object to perform a different task, such as grasping and moving an object," she said. "We can then take those same skins off that object and put them on a shirt to make an active wearable device." Robots are typically built with a single purpose in mind. The robotic skins, however, allow users to create multi-functional robots on the fly. That means they can be used in settings that hadn't even been considered when they were designed, said Kramer-Bottiglio. Additionally, using more than one skin at a time allows for more complex movements. For instance, Kramer-Bottiglio said, you can layer the skins to get different types of motion. "Now we can get combined modes of actuation — for example, simultaneous compression and bending." "One of the main things I considered was the importance of multifunctionality, especially for deep space exploration where the environment is unpredictable," she said. "The question is: How do you prepare for the unknown unknowns?"